"About 20 Rutgers University students staged a sit-in in the administration building on the New Brunswick campus today to protest tuition hikes and demand a response from President Richard McCormick." To read the entire article in The Star-Ledger, click here. 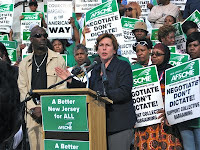 Members from AFT Local 1904 went to Newark on the evening of April 26, 2011 to hear Randi Weingarten, President of the American Federation of Teachers, speak as well as others including the Rev. Al Sharpton, who is a long time Labor supporter. Members are encouraged to review and comment on the University's Strategic Plan. The plan can be found on our website. AFT, in conjunction with Labor, Community and Faith Leaders, is holding a rally in support of collective bargaining and workers rights on Tuesday, April 26, 2011 at 5:30 p.m. 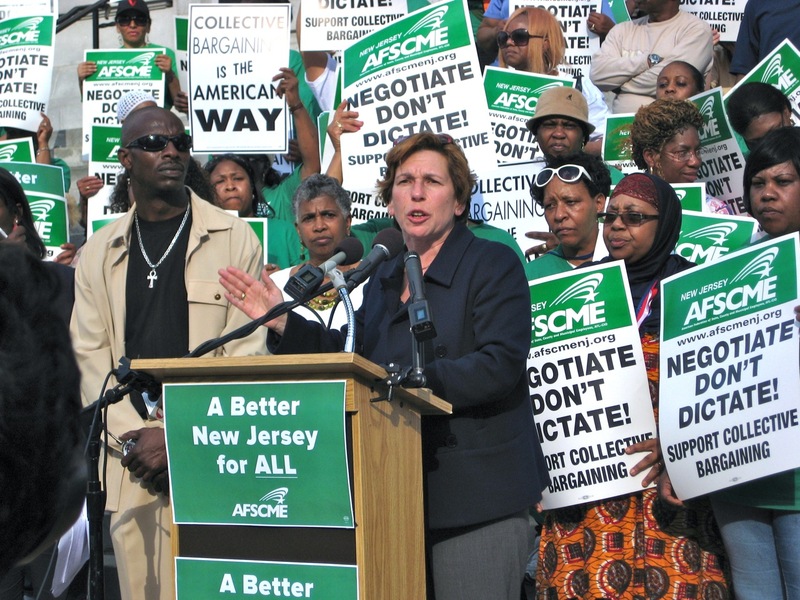 The featured speaker will be AFT President Randi Weingarten. The rally is the culmination of a community and labor tour on the 26th that begins in Vineland, moves onto Trenton and ends in Newark. If you wish to attend, please contact the Local via email msuaftlocal1904@gmail.com. Let us know if you will need transportation. AFT T-shirts are also available for pick-up in the Local's office, CO 314A, in sizes small, medium, large and extra-large. If you are taking yourself to the rally and need the address, City Hall in Newark is located at 920 Broad Street, Newark, New Jersey. On April 14, 2011 President Rich Wolfson addressed the MSU Board of Trustees. President Wolfson’s message was that of renewal and addressed several topics which included tuition increases. A full copy of his speech is available here. At the April 8th Council of New Jersey State College Locals meeting, Bill Sullivan was elected Executive Vice-President and Jennifer Higgins was elected Representative for Professional Staff. Winning these positions show how respectful the Council delegates are to the input of our local over the last year. Having these two seats on the Council Board gives us that much more of an opportunity to represent our members. Bill Sullivan and Jennifer Higgins will bring our most pressing issues to the Council in the coming months in what will most certainly be difficult negotiations with the State. Thank you Bill and Jennifer for stepping up in these significant state-wide positions. Forty-three years ago my father, Martin Luther King Jr., was assassinated while he was in Memphis, Tenn., supporting a strike of municipal sanitation workers. It was, in his eyes, more than a quest for a few more dollars in a paycheck. He saw the strike as part of the great struggle of his time—a struggle for democracy, for truth, for justice and for human dignity. These are the same basic reasons that my father would be joining with millions of other Americans today in supporting public employees in Wisconsin, Indiana, Ohio and other states, where collective bargaining is now under attack. Written by Martin Luther King III, president and chief executive officer of The King Center. Wear your AFT t-shirt to work or wear a blue shirt and an AFT button to show your solidarity and commitment to Higher Education. Be sure to share with others how we, as Faculty, Professional Staff and Librarians contribute to student success. If you don't have an AFT t-shirt or button contact the Local's Office to request one - union@mail.montclair.edu or ext. 4453. We will get one to you as soon as possible. We will be taking a picture of those wearing AFT t-shirts at the General Union Meeting at 2:30 on April 6, 2011. Come to the meeting, eat the food and get in the picture. We'll also have buttons and some t-shirts there if you need one. April 4 is the 43rd anniversary of the death of Rev. Dr. Martin Luther King Jr. He was assassinated in Memphis while supporting striking municipal sanitation workers there. The Memphis strike was one of many struggles to establish unionization and bargaining rights for public employees in the US. Today, the bargaining rights of public employee unions are again under attack across the country. In honor of Dr. King, unions around the country are taking actions in support of public employee unions. In New Jersey, the contracts of all state employees unions will expire on June 30 and the Governor Christie has promised to be "aggressive and adversarial" in contract negotiations. He is refusing to negotiate the cost coverage of our health care benefits. Instead, he insists that our health care costs and coverage be legislated. In response, members of New Jersey AFL-CIO unions are participating in an email-writing campaign to our legislators. We ask that you take a few moments to contact your NJ state assembly persons and senator and demand that our health care benefits be negotiated at the bargaining table, not legislated by the legislature. The easy-to-follow directions by clicking here.